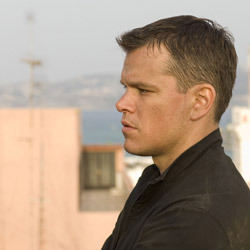 The Bourne Ultimatum is coming to theaters this summer. There’s a sneak-peek trailer on firstshowing for this third episode of the Jason Bourne series starring Matt Damon. It looks good. At first, I thought I should post this in the Whatsis category of Zoomstart which is just an archive for cool stuff. And then I figured, since I’m a big fan (of the first movie, not so much the second), I’d take some lessons from the Bourne Identity and turn them into a mini ultimatum … er … ultimate guide to leadership. Sort of like what I did with Frank Miller’s 300. So “Sit down, strap in, and turn on all you got”. If you lose your identity, go find it. It happens to every leader. You might lose faith in your own ability. People might question or challenge or lose confidence in you as a leader. Take the time. Reach out. Go find that person that was you again. Maintain balance. You’ve got your good guys, your bad guys, your love interest. All play an important part in maintaining a healthy balance. Balance gives you a diverse network of resources to draw on. Balance changes things up and prevents you from getting tunnel vision by focusing too much on one thing. Make the most of what you have. Maybe you brought a ballpoint pen to a gunfight, or a Mini Cooper to a car chase. Whether you’re under cost controls or you just got caught short-handed, you’ve got what you got. Get creative and make the most of it. Take the fight to them. The best defence is a good offence. You can sit around and let whatever happens happen. Or you can take the initiative and make things happen. Do that, and your actions are the driving force that decides WHAT happens. And when. There’s always another chapter. The story’s never over. No matter what happens, the worst thing that can happen is that you learn something and you do better next time. Leadership is not a destination, it’s a journey. And there’s always another adventure around the next bend. Great post. I liked the 5 points, especially taking initiative and that leadership is a journey..so true! I actually really like “Take the fight to them” myself!